La historia de los inicios de Guns n' Roses tendrá adaptación cinematográfica basada en el libro de 2008 'Reckless Road', una biografía autorizada por la banda estadounidense escrita por Marc Canter. "Cuando os enteréis de quien está haciendo la película, comprenderéis que va a ser genial", ha escrito Canter en el foro dedicado al grupo MyGNRForum, donde ha asegurado que contará con actores de primer nivel. A pesar de que, tal y como señala The Guardian, se desconocen detalles sobre estudio, productores o director, el proyecto aparentemente lleva ya unos cuatro meses en marcha, con Canter supervisando el guión. "La gente con la que estoy trabajando son los mejores para este proyecto. La película va a ser un pelotazo y conseguirá un montón de nuevos fans para la banda y conseguirá vender muchos discos", asegura Canter. A pesar de no contar con el apoyo explícito de Axl Rose, único miembro fundador del grupo, Canter se muestra convencido de que quedará contento con el resultado, ya que ayudará a aclarar muchas historias internas del ascenso a la fama de Guns n' Roses. "He llegado a un punto de mi vida en donde siento que tengo que dedicar el tiempo a mi banda SIXX: AM, mi adorable esposa y la familia, y a las muchas y nuevas aventuras que nos depara el futuro." GUNS N' ROSES guitarist D.J. 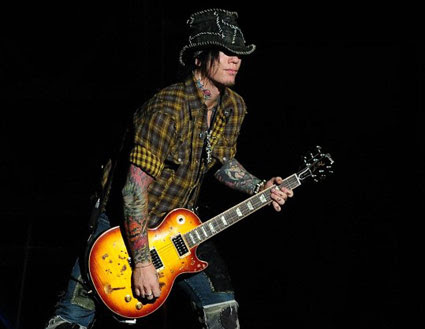 Ashba has announced his departure from the Axl Rose-fronted outfit. He says in a statement: "Six years ago, I received a call that changed my life forever. The call was from a dear friend of mine (Katie McNeil-Diamond) who was working with GUNS N' ROSES. It was an offer to audition for Axl Rose and earn a role in arguably the biggest rock band of my time. While I thought it was a complete long shot, I decided to go ahead and give it a try. Much to my shock and surprise, I got the gig. And so began the most incredible journey I could have possibly imagined. I was blessed with the opportunity to not only work with one of the most talented bands, but also to share the stage with a living legend and a truly gifted human being, Axl Rose. The amount of confidence and trust that Axl placed in me was genuinely heartwarming and truly career-defining. In the years that followed, I traveled the world many times over and played these incredible songs night after night to the most enthusiastic and loving crowds. As you can imagine, the friendships that were forged during that time were deep and long lasting. But the most beautiful surprise of all was YOU... the fans. You welcomed me into your lives with open arms and showed me love and support that I could only have dreamed of. From the very first time I stepped on stage and started playing 'Welcome To The Jungle' and felt the crowd erupt, I knew my life would never be the same. I'm not gonna lie...I was terrified!! But you were so accepting. You immediately turned my fear into pride. For that, I am truly grateful. "So now it is with a very heavy heart and yet great pride that I announce that I've decided to close this chapter of my life and encapsulate the wonderful times that I've shared with GUNS N' ROSES into fond memories. I have reached a point in my life where I feel its time to dedicate myself to my band SIXX: A.M., my adoring wife and family, and to the many new adventures that the future holds for me. Guns N 'Roses, con los miembros fundadores Axl Rose y Slash, encabezarán el "Coachella Music & Arts Festival" en Indio, California (del 15 al 17 y del 22 al 24 de abril) de acuerdo con múltiples fuentes. La banda también está negociando con los promotores para tocar en un máximo de 25 estadios de fútbol, en el verano de 2016 en EE.UU. Uno de esos conciertos sería en el nuevo "Arena de Las Vegas", que se inaugurará el 6 de abril. Se dice que Guns N 'Roses piden 3 millones de dolares por concierto, con las entradas superando el rango de los 250-275 dolares. Por lo visto el 5 de enero se conocerá el resto de los miembros participantes en la reunión. Guns N’ Roses, with founding members Axl Rose and Slash, will headline the Coachella Music & Arts Festival in Indio, Calif., set for April 15-17 and April 22-24, according to multiple sources. The reunited band is also negotiating with promoters to play as many as 25 football stadiums in North America in the summer of 2016, and is scheduled to be one of the first acts to play the new Las Vegas Arena, set to open April 6. Guns N' Roses is said to be asking as much as $3 million per show, with tickets topping out in the $250-$275 range. The last show Axl Rose and Slash played together was on July 17, 1993 at River Plate Stadium in Buenos Aires. Guns N' Roses' most recent tour, which only included Axl Rose from the original lineup, took place primarily in South America and The Joint in Las Vegas, grossing $15.2 million. Representatives for the band, as well as Coachella producer Paul Tollett and agent Ken Fermaglich at United Talent Agency, could not be reached for comment. Executives at AEG, which will operate the new Vegas arena, also did not immediately respond to a request for comment. The band's first album, Appetite for Destruction, is the biggest-selling debut in U.S. history, with 18 million sold. It spent five weeks at No. 1 on the Billboard 200 chart, and launched the No. 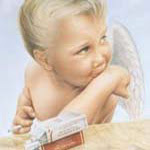 1 Billboard Hot 100 single "Sweet Child O' Mine." They have sold 44.5 million albums total in the U.S., according to the Recording Industry Association of America. Billboard's confirmation comes on the heels of two rumor-inducing hints dropped over the past week, the first a cryptic update to the Guns N' Roses website and the second during screenings of Star Wars: The Force Awakens, where footage of a concert crowd was shown with GN'R music overdubbed. Though longtime fans may be understandably wary after the decade-plus wait for Chinese Democracy, which became a totem of sorts to frontman Axl Rose's sometimes unpredictable behavior, this reunion bears no sign of that record's bumpy road. Coachella has a pedigree for coaxing much-loved acts out of retirement, or being the linchpin to plans that had already been simmering. The fest has previously hosted the reunions of Rage Against The Machine in 2007, My Bloody Valentine in 2009, Pulp in 2012 and Outkast in 2014 -- not to mention Tupac's posthumous return to the stage in 2012. Guns N' Roses will arrive a year after two other legendary acts, AC/DC and Steely Dan, headlined the 2015 edition. Last year's edition drew 198,000 to the California desert, generating $84.2 million in revenue, according to Boxscore. Confirmación oficial de que GUNS N' ROSES tocarán en el el "Coachella Music & Arts Festival"
Se confirma oficialmente la noticia ya por todos conocida de que los Guns N' Roses (reunidos) encabezarán el "Coachella Music & Arts Festival" en el que actuarán los días 16 y 23 de abril de 2016. ¿Quién estará de la formación clásica en la reunión de GUNS N' ROSES? De acuerdo con un nuevo comunicado de prensa (05 de enero), Axl Rose estará acompañado por Slash en la guitarra y por Duff McKagan en el bajo. Aunque el comunicado de prensa no menciona a nadie por su nombre, varias informaciones indican que el trío estará acompañado por miembros de la alineación del disco "Chinese Democracy". Por lo que podrían formar parte de la reunión Dizzy Reed en los teclados, el multiinstrumentista Chris Pitman, Richard Fortus en la guitarra rítmica y en la batería Frank Ferrer. Una vez más, no hay ninguna mención al guitarrista Izzy Stradlin o a los baterias Steven Adler y Matt Sorum. Pero, ¿quién sabe? ; todo es posible. Según Consequence of Sound, Sorum estuvo en un momento dado, pero al parecer su mala relación con Axl, dio lugar a la participación de Ferrer. For the first time since 1993, a good chunk of Guns N’ Roses’ classic lineup will perform together when they headline the 2016 Coachella Music Festival in April. According to a new press release (January 5), GNR singer Axl Rose will be joined by Slash on guitar and Duff McKagan on bass. Although the press release doesn't mention anyone else by name, multiple reports indicate the trio will be joined by members of Guns N' Roses' Chinese Democracy-era lineup. This might (or might not) include keyboardist Dizzy Reed, multi-instrumentalist Chris Pitman, rhythm guitarist Richard Fortus and drummer Frank Ferrer. Again, there is no mention of guitarist Izzy Stradlin or drummers Steven Adler and Matt Sorum. But who knows what announcements lie ahead; anything is possible. According to Consequence of Sound, Sorum was, at one point, connected to the reunion talks, but (it seems) his poor relationship with Axl led to Ferrer's involvement instead. Guns N’ Roses also are expected to announce a full U.S. summer tour, so stay tuned for that announcement. 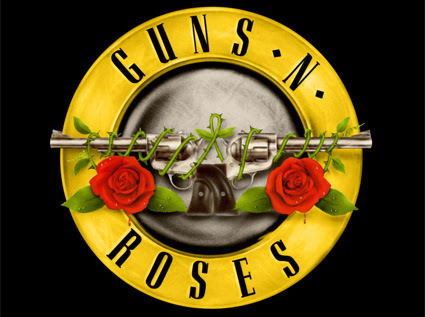 "Upholding a three-decade tradition of breaking ground, creating trends, and forever changing the face of rock ‘n’ roll, Guns N’ Roses announce the most significant and anxiously awaited musical event of this century. Founder Axl Rose and former members Slash and Duff McKagan will regroup to headline the Coachella Music & Arts Festival (April 15-17 & April 22-24)—as announced last night!" Malo me parece ya desde el principio. Y mira que ha tenido cobertura incluso en la TV. Pero solo hace referencia a Slash y a Duff, y esto, ahora. En su momento, bajo la denominación de "REUNION" (a medias) van a a hacer caja (y buena, porque a doscientos y pico dólares la entrada) para dar los conciertos de siempre (y que iban a hacer si no?) sin dar datos a la formación que iba a ser. Cuando te informan que es la reunión de los miembros originales o, Guns 'N' Roses se reunen... tiendes a pensar que la formación será la original. No hace falta darle más vueltas. Ni los Guns son los que son y los que quedan, tampoco están para muchas historias. Al final, si el tema vale para hacer caja y asegurarse una jubiliación digna: Sea pues. Pero a mí, personalmente, me importa un carajo. Soy (supongo que de los pocos así que pido disculpas) de los que piensa que Guns 'N' Roses estuvo muy sobrevalorado en su momento (igual que Nivarna) pero que básicamente, quitando el relumbrón... es una banda de rock con más cobertura de la que, personalmente, se merecen. - ¿Por qué seguimos admirando a ciertas personas a pesar de que hayan demostrado ser mucho peores que otras a las que detestamos? - Por qué determinados rasgos admirados en la ficción nos resultan repulsivos en la vida real. Probablemente fue uno de los últimos coletazos de la industria antes del virus Nirvana, en EE.UU las nuevas generaciones aun piensan que el rock es aburrido y una mierda, porque un publicista dijo que los tristes eran lo mas grande... No me habléis de Nirvana que me caliento, fueron más fraude que los Milli Vanilli. 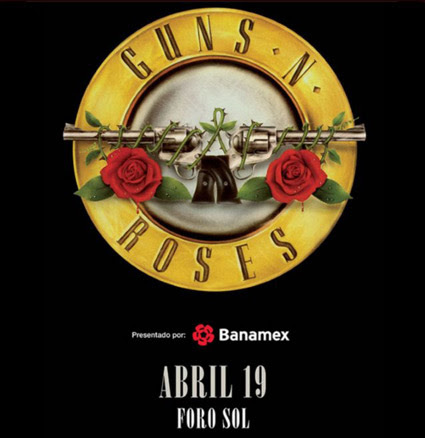 Guns N’ Roses continúa generando revuelo y aumenta el frenesí de sus fans al anunciar una fecha más en Norteamérica con la adición de un concierto en el Foro Sol de la Ciudad de México programado para el 19 de abril de 2016. La Preventa Banamex comienza a las 11 AM del 8 de febrero y termina el 9 de febrero a las 10 PM. La Venta General comenzará el miércoles 10 de febrero a las 11 AM a través del Sistema Ticketmaster en http://www.ticketmaster.com.mx. Los miembros de Nightrain, el Club de Fans Oficial de Guns N’ Roses serán notificados con anticipación para tener la oportunidad de comprar boletos en una preventa especial.